The CBI today questioned ousted Railway Minister Pawan Kumar Bansal, an MP from Chandigarh, for six hours over his role in the alleged bribery scandal involving pay-offs to appoint top officials on the Railway Board. Bansal had resigned as the Railway Minister after his nephew Vijay Singla and a member of the Railway Board, Mahesh Kumar, were arrested. A local court today granted bail to Gurunath Meiyappan, former CEO of Chennai Superkings, actor Vindoo Dara Singh Randhawa and six others who were arrested in connection with the IPL spot-fixing scandal. Yet another trouble is brewing for beleaguered BCCI chief N Srinivasan, this time involving his company’s investment in business ventures of jailed MP and YSR Congress president YS Jagan Mohan Reddy. Srinivasan was forced to step aside following his son-in-law’s arrest in the IPL betting scandal. A special CBI court today granted permission to the central probe agency to arrest Gujarat IPS officer D G Vanzara, in the 2004 Ishrat Jahan fake encounter case. The Maharashtra Government has ordered removal of beacon lights from the vehicles of officials, who are not entitled to their use. A government resolution to this effect was issued on Monday, an official release said. India and New Zealand today decided to speed up negotiations on a free trade agreement (FTA) between the two countries. “An FTA is an immediate goal for us. 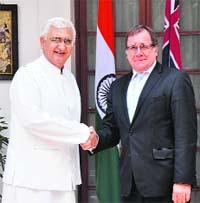 In pursuing the FTA, we believe that the potential of the relationship between New Zealand and India will be unlocked,” New Zealand Foreign Minister Murray McCully said after wide ranging talks with External Affairs Minister Salman Khurshid here. Facing the threat of cancellation of its Rs 3,600-crore deal for VVIP choppers, AgustaWestland has asked the government to release its payments saying withholding it was a “breach of contract”. Even as global warming and climatic changes remain on the forefront of international debates, observations by the Geological Survey of India (GSI) have found a reduction in the rate of glacial snout as well as higher accumulation of snow on ice shelf and polar ice sheet at the India’s Antarctica station. This, GSI scientists say, indicates the commencement of cooling cycle in East Antarctica. A 30-year-old American woman was raped by three persons on Monday in a private vehicle, suspected to be a tipper, when she got a lift from Vashisht to Old Manali near here. The police has registered a case under Section 376 of the IPC, but the police is yet to identify the vehicle and arrest the suspects in the case. The Union Cabinet today decided to undertake a slew of social welfare measures, including extending the Rashtriya Swasthya Bima Yojna (RSYB) to five more categories thereby benefitting around 85 lakh workers in the unorganised sector. A more inclusive national counter terrorism centre (NCTC), which addresses the prime objections of states, is expected to be finalised at the internal security conference of chief ministers here tomorrow. The Prime Minister is scheduled to inaugurate the conference. With Islamabad making a big issue of the accident and subsequent ‘assault’ on a Pakistani diplomat in New Delhi last evening, Foreign Secretary Ranjan Mathai today rang up his Pakistani counterpart Jalil Abbas Jilani and assured him that any security concerns the neighbouring country might have about the security of its staff would be addressed. The CBI today questioned ousted Railway Minister Pawan Kumar Bansal, an MP from Chandigarh, for six hours over his role in the alleged bribery scandal involving pay-offs to appoint top officials on the Railway Board. Bansal had resigned as the Railway Minister after his nephew Vijay Singla and a member of the Railway Board, Mahesh Kumar, were arrested. It was alleged that Mahesh Kumar paid money to Singla to become a member on the board and Singla was caught accepting a bribe of Rs 90 lakh. Sources in the CBI said: “We are looking at a role, if any, played by Bansal in this offence”. Bansal has not been given a clean chit, nor was he called for questioning to be a witness in the case. He is being questioned to corroborate the statements made by suspended Railway Board member Mahesh Kumar to the CBI. Meanwhile, Bansal has reportedly told the CBI that he has “lost touch” with his nephew Vijay Singla, an accused in the Railway bribery scandal. During the questioning, Bansal reportedly told the CBI that he was not aware whether Singla had carried out any deal in his name. The former minister was questioned by the CBI team probing the matter on Mahesh Kumar claims that he paid money to Singla, sources said. Bansal was unavailable for comment later in the day. The CBI has managed to secure all files pertaining to the appointment and also recorded the statement of Mahesh Kumar, his nephew and Bansal’s private secretary Rahul Bhandari. Bansal has, in the past, maintained that he has done no wrong in the appointment of Mahesh Kumar as member of the Railway Board, a post equivalent to the Secretary in government. The CBI has secured all the files pertaining to the appointment and also recorded the statement of Mahesh Kumar. Lateral shifting of the board members is done in the same manner as the appointment of a new member, which is finalised after vigilance clearance and the nod of the appointments committee of the Cabinet. Over 1,000 phone calls were intercepted during the two-month surveillance on Mahesh Kumar and Singla. The CBI has so far arrested nine persons in the case. All of them were produced before the court, known as the Killa court, which granted bail on the bond of Rs 25,000 each. They have been asked to appear before the investigating officer every alternate day. Under the bail conditions set by the court, they will not be able to leave the country. Meiyappan’s lawyer Aabad Ponda argued before the court that his client was not involved in match-fixing or spot-fixing. The Chennai team CEO, his lawyer argued, was accused of only placing bets with Vindoo which was a bailable offence. escape from Mumbai since they were not listed as wanted accused when they left Mumbai. In addition to the duo, six others, including alleged bookies Ramesh Vyas, Prem Taneja, and alleged hawala operator Alpesh Patel were also granted bail. Soon after his release on bail, Vindoo's lawyers said they would sue the Mumbai police before the Bombay High Court for wrongful arrest and character assassination. ''The case under which my client was arrested is illegal and I think we should apply for compensation to the high court,'' Maneshinde told reporters. The CBI is probing the alleged quid pro quo investments by India Cements, of which Srinivasan is the chairman and managing director, in Reddy’s ventures. The investigating agency had questioned Srinivasan twice in June last year regarding his company’s investments in Bharati Cements and Jagathi Publications, both owned by Reddy. Sources say the CBI will soon file a separate charge-sheet in the special CBI court regarding the investments made by India Cements in return for “favours” it had received when Jagan’s father YS Rajasekhar Reddy was the Chief Minister of the state between 2004 and 2009. India Cements and Srinivasan are likely to be named as the accused in the case. According to the PIL petitioner Sharmila Ghuge, a professor of law from Mumbai, Delhi and Maharashtra police are investigating the allegations without any coordination or sharing information and “are acting hand in glove with some politicians to cover up the issue and save the real culprits” despite having evidence against them. The involvement of influential persons in the illegalities running into thousands of crores of rupees was evident from the possible murder of Delhi Police inspector Badrish Dutt, who was instrumental in initiating the probe into match-fixing allegations, the PIL said. Dutt was found dead on May 20 under mysterious circumstances. While Delhi and Mumabi police had registered cases under the anti-gambling laws which would result in minimal punishments, the crime committed by the culprits “are gigantic and monstrous for the society at large” and posed a serious threat to the integrity, security and economy of the nation, the petitioner said. The PIL was mentioned today before the vacation Bench pleading for an early hearing upon which it assured the petitioner that the matter would be taken up next week. Vanzara, who is also one of the main accused in the 2005 fake encounter case of Sohrabuddin Shaikh and the murder of his wife Kausar Bi, was yesterday brought to Sabarmati Central jail from a Mumbai jail where he was lodged. Mumbai court had yesterday issued orders, under section 36 of Criminal Procedure Code(CrPC), to shift Vanzara to Ahmedabad jail under tight security following the order of the city CBI court to grant his custody to the investigating agency in the Ishrat Jahan case. Today, investigating officer of the case and CBI DySP G Kalaimani filed an application before Additional Chief Judicial Magistrate (ACJM) of the CBI court requesting to grant permission for Vanzara's arrest. ACJM S H Khutwad, while granting permission under section 57 of the CrPC, also directed the CBI to provide tight security to the accused and allow him to have food from home. After his arrest, the agency will produce Vanzara before the CBI court within 24 hours and it is likely to seek his custody. Vanzara, as per CBI complaint, had led the team of Detection of Crime Branch (DCB), Ahmedabad, which was involved in the killing of Ishrat Jahan, Javed Shaikh, alias Pranesh Pillai, and two alleged Pakistani nationals Zeeshan Johar and Amjad Ali Rana on June 15, 2004 in the city outskirts. Gujarat police had then claimed that they were part of the conspiracy to assassinate Chief Minister Narendra Modi. After Jahan's mother complained about the alleged fake encounter, Gujarat High Court constituted a Special Investigation Team (SIT) which concluded that it was fake. Following the report, the high court handed over the case to the CBI on December 1, 2011 and is monitoring the probe. The CBI has arrested six Gujarat cops -- IPS officer G L Singhal, Tarun Barot, J G Parmar, Bharat Patel, Anaju Chaudhary and N K Amin -- in the case. Except Amin, all five accused have been granted bail in the case as the CBI had failed to file its chargesheet before the court within stipulated time of 90 days of their arrest. The resolution lays down guidelines to govern the use of beacon lights and prevent their misuse. If police or transport officers notice misuse of beacon lights, they should bring it to the notice of the secretary of the department concerned, the release says. India and New Zealand today decided to speed up negotiations on a free trade agreement (FTA) between the two countries. “An FTA is an immediate goal for us. In pursuing the FTA, we believe that the potential of the relationship between New Zealand and India will be unlocked,” New Zealand Foreign Minister Murray McCully said after wide ranging talks with External Affairs Minister Salman Khurshid here. Observing that economic relations were a strong pillar in bilateral partnership, Khurshid said both India and New Zealand recognised that there was a great potential to further strengthen bilateral trade and investment relations. “India and New Zealand are currently working for an early conclusion of the FTA. It will help further enhance our trade and investment relations in the future,” the Indian minister said. The two countries have been negotiating the FTA for almost two years now but have still not been able to resolve some differences. New Zealand wants India to address the issue of duties levied on its products in India. The two countries also reviewed the progress in firming up a mutual legal assistance treaty between them. Talking about growing economic ties, Khurshid said a number of Indian companies in banking, minerals, IT and others have established business in New Zealand. "Our cooperation in agriculture, especially in high- yielding varieties, food processing and agro machinery are areas of further potential. "Collaboration in science and technology, with technology cooperation, joint projects and training is growing," he said. Asked why there was delay in signing up of a FTA, Khurshid said, "Good wine always takes time to mature". In a letter written to the Ministries of Defence, Finance and External Affairs, the Anglo-Italian firm has said there were certain “contractual difficulties” with the Defence Ministry and asked for its payments to be released. India has made around 30 per cent of payment and withheld the remaining after the Italian investigators arrested former CEOs of Finmeccanica and Agusta for allegedly paying Rs 362 crore as kickbacks to swing the deal in its favour. Observations carried out at Dakshin Gangotri, India’s permanent station on the frozen continent, have revealed that while the average recession of the Dakshin Gangotri Glacier during the last decade was 15.63 m, the snout of the glacier receded by an average of 33 cm in 2011, which is lesser than the previous year, GSI’s recently released report, Glaciological Studies in Central Dronning Maud Land, East Antarctica during the 31th Indian Antarctic Expedition (2011- 2012), has stated. In the western extension of the glacier snout, data recorded at 13 points has shown an average annual advancement of 72 cm in comparison to previous year (2010). The snow accumulation and ablation of the ice shelf is being monitored by two observation networks and have shown accumulation of 91.33 cm and 93.35 cm, respectively. The observation network on the ice sheet has also showing snow accumulation of 56 cm. Glaciological observations in Antarctica started since the beginning of the Indian Antarctic Programme in 1981 and are continuing till date. Antarctica provides a unique environment to study the interaction of glaciers, oceans and climate. In a complaint lodged with the police, the American tourist said she had arrived at Manali along with her friends for the first time. She could not get a taxi to reach her room from Vashisht and she got a lift in an unidentified private vehicle, which was passing by. She alleged they raped and dropped her at an isolated spot. Kullu Superintendent of Police BK Dhavan said the police has lodged an FIR, but the victim could neither note the number nor could give a proper description of the vehicle as the incident took place at late night hours. The scheme will now cover rickshaw pullers, rag-pickers, mine workers, sanitation workers, autorickshaw drivers and taxi drivers. It would have Rs 210-crore financial implication for 2013-14 and Rs 419.89 crore from next financial year onwards, Finance Minister P Chidambaram said at a briefing after the Cabinet meeting. Around 3.4 crore smart cards had been issued for the Rs 30,000 per annum cashless health insurance cover for BPL families under the scheme launched in 2008. In another decision the Cabinet approved the management of central public sector enterprises to start wage negotiations with effect from January. The move is expected to cover 14 lakh employees at the end of a negotiated five-year wage agreement. The Cabinet also cleared the setting up of a Central Institute of Hotel Management, Catering Technology and Applied Nutrition (Jagdishpur) Society with a funding of Rs 47.86 crore. It would be based in Sultanpur district of Uttar Pradesh. The place is close to Amethi, the Lok Sabha constituency of Rahul Gandhi. The institute would be constructed in 5 acres. The land would be provided by the UP Government free of cost. It would have hostel facility for 400 students and a 30-room hotel, known as applied training centre. While the institute was expected to be completed in two years, the hostel would take 30 months to be constructed and classes would commence from 2015-16. The Ministry of Home Affairs (MHA) has modified the original NCTC memorandum issued on February 3, 2012 which was objected to by several states like Punjab, Gujarat, Bihar, West Bengal and Madhya Pradesh, among others. Chief Ministers had opposed the original proposal of the NCTC saying it would infringe upon the states’ power and hurt the federal structure of the country. As a result of this the February 3, 2012, order was held in abeyance. He also informed the Pakistani diplomat that action had already been taken in the accident case with the arrest of one person. “The call was made in the context of need to ensure high-level contact at a time when the Pakistani High Commissioner to India was in Islamabad and the Indian High Commissioner in Islamabad was in Delhi for consultation,” official sources said. Earlier in the day, Pakistan summoned Indian Deputy High Commissioner Gopal Baglay to the foreign office in Islamabad to register its protest over the ‘assault’ on the diplomat who was involved in the accident. The Indian official was told that Islamabad desired an investigation into the accident in which the car of Zirgham Raza, First Secretary (Trade) at the high commission, hit a motorcycle near the JNU campus here, sources said. Islamabad also sought punishment for those who attacked the Pakistani diplomat and his driver following the accident. Pakistan reiterated its demand that India ensure the safety and security of its personnel, premises and vehicles at the high commission in accordance with the Vienna Convention on diplomatic relations and international diplomatic practice. Meanwhile, commenting on the accident, MEA spokesman Syed Akbaruddin said a ‘minor accident’ involving the car of the Pakistani diplomat occurred last evening. The driver of the car bearing a diplomatic number plate had hit a motorcycle. Both the motorcyclist and the woman passenger riding pillion suffered injuries from the fall. Subsequently, the driver of the car and the motorcyclist had an altercation and reportedly a scuffle ensued wherein the Pakistani mission driver and the diplomat suffered minor injuries. Police responded promptly to calls for assistance and escorted the two to safety from the crowd of onlookers who had gathered at the site of the incident. The police extended the mission officials due courtesies and escorted them to the AIIMS trauma centre and offered medical assistance and examination. They were later escorted back.